Rights Watch, where she was responsible for organizational management and spearheaded a strategic plan for the global expansion of the organization. During the Clinton administration she served as deputy to the Ambassador for U.N. Management and Reform at the U.S. Mission to the United Nations, where she was the lead U.S. representative to the U.N. General Assembly negotiating a deal to settle the U.S. arrears to the world body. During the early 1990s Nossel worked in Johannesburg, South Africa, on the implementation of South Africa’s National Peace Accord, a multi-party agreement aimed at curbing political violence during that country’s transition to democracy; she has also done election monitoring and human rights documentation in Bosnia and Kosovo. Nossel is the author of a 2004 article in Foreign Affairs magazine entitled “Smart Power” and coined the term that Secretary of State Hillary Clinton has made a defining feature of U.S. foreign policy. Fundamental to understanding the thinking behind the new leadership at Amnesty International is an understanding of how Nossel conceives ‘Smart Power’ and her understanding of US foreign policy. So before having a closer look at what Nossel means by ‘Smart Power’, lets look have a quick look at Nossel’s heroes’ foreign policies. It was under Roosevelt’s watch that the USAF participated in the firebombings of Dresden and other German cities which resulted in the deaths of thousands of civilians, refugees, innocent women and children. FDR (and Truman) were also responsible for Operation Keelhaul under which Soviet POWs and refugees were returned to face internment, torture and in many case immediate execution by firing squads. It was President Truman, another of Nossel’s heroes, who ordered the annihilation of both Hiroshima and Nagasaki via experimental terror weapons resulting in the massacre and maiming of some 200,000 Japanese women, children and old people. He also took the United States to war against North Korea without consulting congress. In the campaign against the Greek leftists, President Truman authorised the first use of napalm in warfare using ten spitfires and 200 German-made drop tanks. The Truman Doctrine was of course a cloak for American imperialism and provided the theoretical justification for the support of repressive regimes, military dictatorships and terrorist gangs the world over. President John F Kennedy saw Vietnam as an opportunity forth USA to show its “smart power” and by the time he was assassinated 6,000 US military were in the country (up from 900). It was this hero of Nossel who instituted the notorious program (Operation Ranch Hand) using chemical defoliants on the Vietnamese jungle and on farmers’ crops. It was also Kennedy who on November 30, 1961 authorised aggressive covert operations against the communist government of Fidel Castro known as Operation Mongoose. Operation Mongoose was a secret program of terrorism against Cuba the ultimate objective of which was to be able to provide adequate justification for a US military intervention in Cuba. Apparently Kennedy didn’t care for this scheme nor Lemnitzer’s other suggestion which was for the launch of a surprise nuclear war on the Soviet Union. He was so disgusted with him, in fact, that he subsequently appointed him NATO Supreme Allied Commander Europe. I talked about smart power in terms of a couple of different dimensions. One is combining both hard power, military force, coercion with what has been called soft power; diplomacy, the appeal of American culture, its people, economic ties, and viewing those two elements not as alternatives in an either/or sense but rather as complimentary and elements of US power that need to be brought to bear in concert. A second key piece is knowing which of these elements to bring to bear at what time and being creative and innovative in terms of combining different sources of US power to influence the situation. So kind of wisely choosing between a wide array of different tools. And the third piece I talked about was the idea that the use of American power needs to be sustainable and renewable. We need to deploy our power in ways that make us stronger, not weaker. In separating from the President, one key factor is that Democrats must be seen to be every bit as tough-minded as their opponents. Democratic reinvention as a “peace party” is a political dead end. Lets look at some other aspects of Nossel’s published writings so that we have an even clearer idea of where she is taking the organisation. IDF soldier holds a Palestinian child as her mother is arrested and driven off for protesting against the theft of the village well by illegal settlers on the West Bank. The third area we focused on is defense of core principles. At the top of our list is our defense of Israel, and Israel’s right to fair treatment at the Human Rights Council. This is the most challenging issue we face. It is not something by any means that is unique to the human rights council, and I know this has been discussed by Hillel and others who have looked at what is happening across the UN System and across the international system. Israel faces a degree of isolation that is heightened, and we certainly see that at the Human Rights Council. We have been very consistent in standing up and calling votes on resolutions that are biased or one-sided or non-constructive. We will do that even if we are the only one voting against; we don’t hesitate. Just to be clear, the Head of Amnesty International USA pledges to defend Israel and the settlers against complaints at the Human Rights Council regarding Palestinian human rights, the ongoing occupation and theft of Palestinian land. Hillel in the above quote is Hillel Neuer of UN Watch whom Nossel describes as a “colleague” and who played a role in setting up the Libyan intervention as well as defending zionist interests at the UN. So if, in a debate in Spring of 2006 let’s say, the UNSC opts against quarantining Iranian oil, if Tehran’s nuclear program is proceeding apace, peaceful means should be considered exhausted even if the SC members claim willingness to revisit the question of broader sanctions at a later time. In 2003 Nossel fully supported the invasion of Iraq albeit she wanted a delay to allow the US to get more international support in the UN. 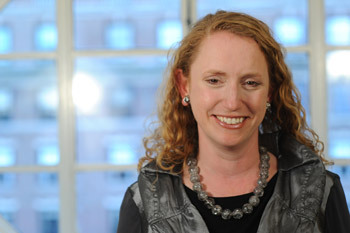 Given that Suzanne Nossel is an advocate for war, particularly against Israel’s enemies, and a firm believer in NATO and US power, what has this meant for Amnesty in the last few months? Well not surprisingly Nossel has used her platform as Executive Director to focus on the State Department’s current main concerns which are Syria and Iran as well as China and Russia, who through their membership of the UN Security Council and insistence on the principles of national sovereignty and non-aggression towards other member states constitute obstacles to US foreign policy. She has also sought to mobilise Amnesty members behind NATO objectives in Afghanistan by presenting the NATO mission there as one of liberating women. 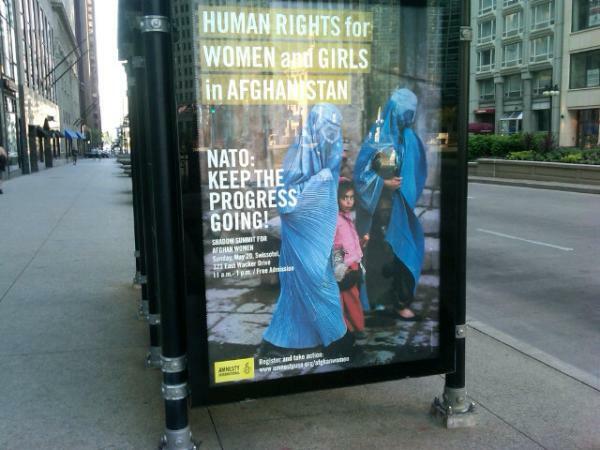 During the recent NATO Summit in Chicago she invited Madeleine Albright to speak on women’s rights at the Amnesty Shadow Summit held in the four-diamond luxury Swissotel in Chicago. I think this is a very hard choice, but the price–we think the price is worth it. Nossel seems to completely fail to understand that her role as Amnesty International Executive Director means she should be seen as independent of the US State Department. A good example of this is in her May 2012 Council on Foreign Relations article on the various machinations at the UN Human Rights Council to get US foreign policy objectives met. Most likely Nossel actually sees little distinction between her two roles, just as she sees no conflict between her current role and having been a member of the executive staff whilst her President and Secretary of State bosses were carrying out war crimes such as drone attacks in Pakistan and Afghanistan and shielding torturers and their enablers in the Bush administration from prosecution. Given the above, it is clear that the appointment of Suzanne Nossel represents the capture of Amnesty International USA by those whose primary interest is the extension of American power by all means, including military. The lady has instituted a purge of the organisation and it remains to be seen if AI members fight back to retake their organisation, if a new organisation will rise up to take the place of AI USA or if the activities of genuine human rights activists will be dissipated throughout a number of smaller organisations closer to the original ideals of Amnesty. What is sure is that with Suzanne Nossel in place, this once noble institution has lost its credibility as an independent organisation and instead become a propaganda vehicle for the State Department and for NATO military intervention in strategic areas around the globe. Human Rights Investigations (HRI) believes genuine human rights organisations should refuse to be used by powerful and wealthy governments to justify waging war or imposing sanctions which harm civilians and children. At HRI we reject U.S.-NATO governments’ national interest agendas and reliance on military force. The world’s greatest problems, and in particular the massive inequalities in wealth and power between the rich and poor, are only exacerbated by war and can only be solved by smart, ethical action based on solidarity with the poor, powerless and oppressed. I was a decades-long supporter of Amnesty International. Many Canadians had issues with the organization over its non-support of Aboriginal human rights during the 1990 ‘Oak Crisis’ at a Mohawk territory northwest of Montreal. I maintained membership in AI Canada despite that warning as to the direction the organization over-all was prepared to take to keep the support of its liberal and largely middle-class base. I finally parted company, with great regret for the direction of the organization, over last year’s NATO ‘liberation’ of Libya. The board of Amnesty International USA have been asked (via aiboard@aiusa.org ) to respond to the points in this article. We await their replies. Unbelievable. I thought it was bad enough when Amnesty UK rewarded the rather poor judgement of its executive with nearly $1M of contributor’s cash, for her and her side-kick. i too am greatly dismayed to learn that Amnesty International USA would hire an Executive Director with views directly opposed to the views I thought I was supporting with my substantial contributions. I feel betrayed. I no longer trust Amnesty, and I no longer know what large organization I can trust. Amnesty will drive formerly caring people into cynicism and apathy. Is there an honest organization anywhere?